Progress on Foundation of Civilisation is going well! 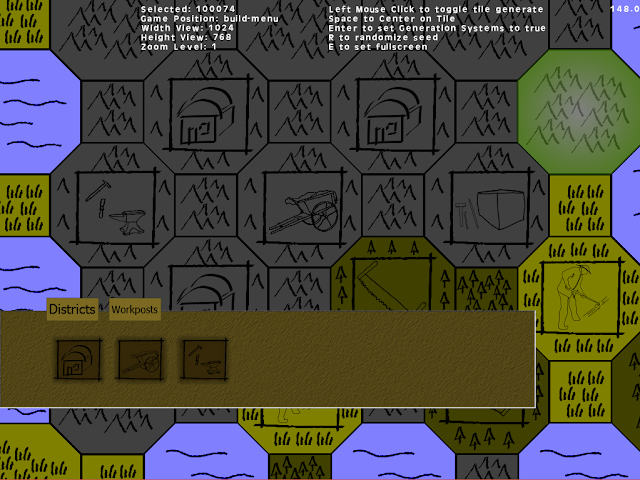 I've implemented the new build interface along with the basic tile-structures found in the concept build! At the moment - the structures non-functional; as I have not yet added the code dealing with the interactions and functionality of the structures. A major priority moving from the concept build to this prototype build is ensuring that the code is easy to work with and clean. A mistake I made in the concept build was that a lot of elements were hard coded - and often in their own relevant objects, making it tedious if I needed to modify something. I set about doing this in two ways primarily; using scripts to handle a lot of the aspects that I believe will need a lot of tuning and adjusting - as well as code I believe I will be returning to often as the project goes on; and with the use of Managers. 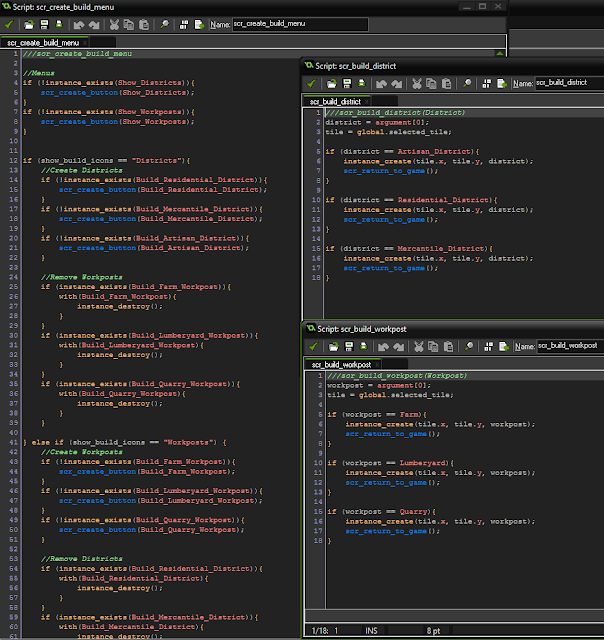 Managers - ranging from BuildManager, BuildingsManager, and ResourceManager up to this point; are simply objects I use to keep certain functionality and variables within. 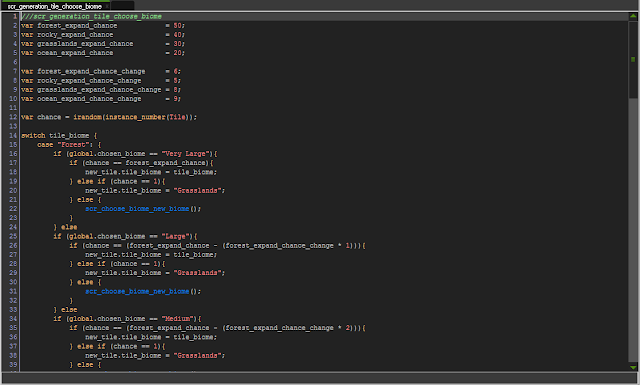 For example; if I wanted to bring up the Build Menu for the player - I simply create the BuildManager. The BuildManager will keep track of the Menu specific information - such as showing Districts or Work-posts. Once the player wants to remove the menu, I simply need to run the return to game script which removes non-relevant UI elements, and remove the BuildManager until it's needed again. 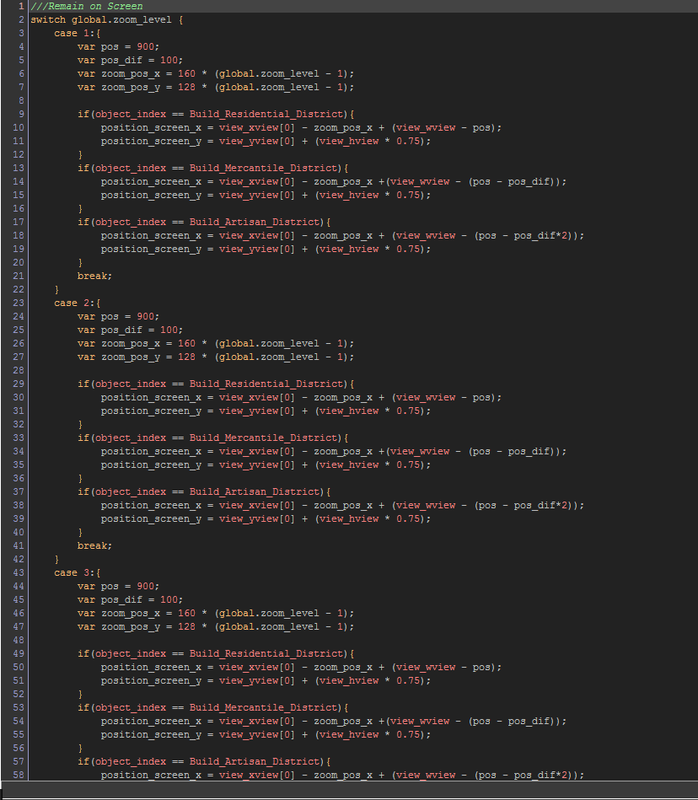 This has been working very well to this point; it has meant that I am working slower than previously - due primarily to needing to plan how I to implement things in a way that remain easy to work with and as clean as possible. The next step is continuing to add the elements to the UI such as building costs, tool-tips and the HUD showing resources and other sub-menu buttons that the player will have available. I have planned out the elements I will need before the project will be more or less similar to the stage the concept build was in - at which point I can begin adding new components to test and play around with! 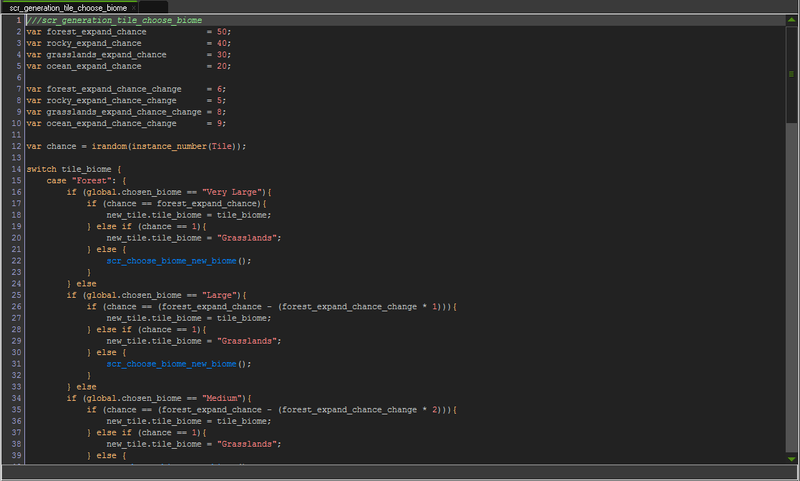 I have noticed that a lot of the posts I have been writing on Tuesdays have been involving Game Maker primarily; which is to be expected as I progress on projects. That being said - I do not wish to neglect other types of posts - as well as my other skill-sets; such as pixel art. These posts will likely be short - focusing primarily on the tiles themselves. I have decided to start posting on Thursdays something I nicknamed Tile-Thursday. Every day, I will be working on creating at a minimum 1 tile. That 1 tile will form part of a major tile-set I will be working on for a while. Whether I decide to change tile-sets every month or a few months I have yet to decide on. 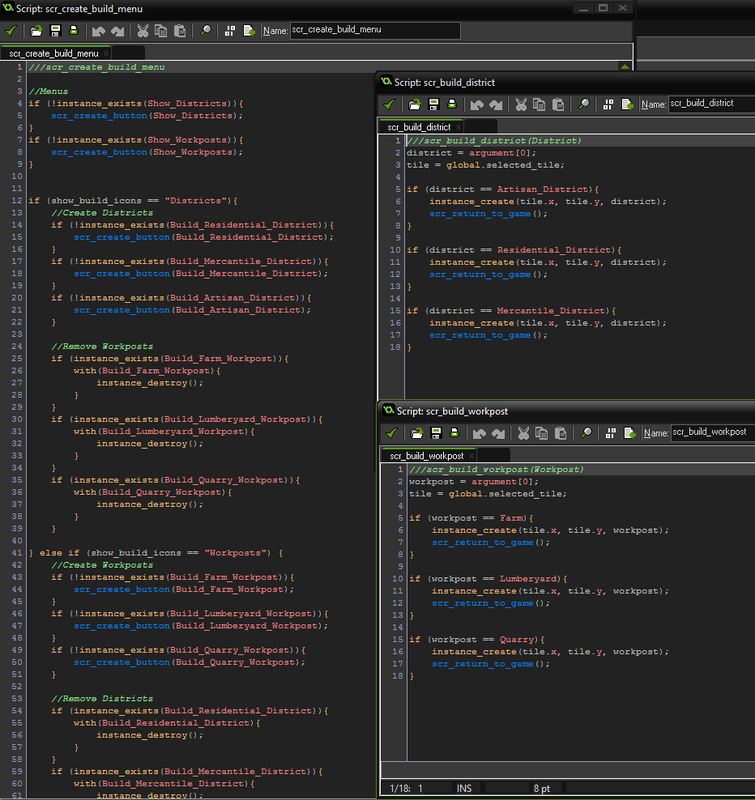 However, the style will needless to say, need to be consistent whilst I am working on a particular tile-set. These tile-sets may be used in future projects, or I will simply have them on hand for prototyping. The intention here is to practice pixel art, even if I am currently not working with pixel art. 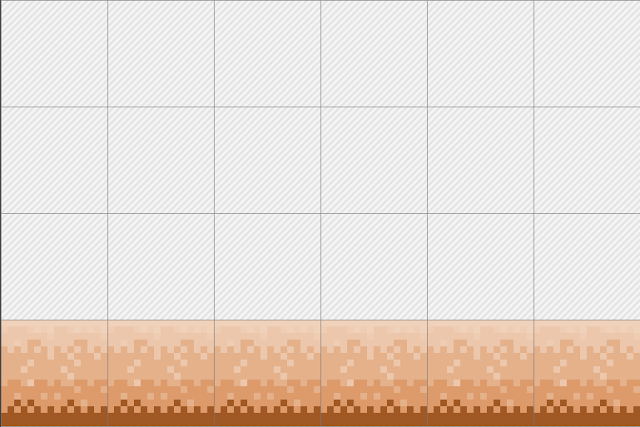 The first tile-set I decided to work on is a 16 x 16 pixel Desert tile-set. Up to this point I finished up a few basic floor tiles - however moving forward I have a few ideas on what I want to add - including elevating terrain, ruins, and natural features such as sand piles, and rocks! Progress on Foundation of Civilisation is proceeding nicely. One the feature I knew I wanted to implement after the concept build is the ability to zoom in and out. Zooming has a lot of benefits to it; from allowing easier planning to giving a sense of scale. The feature was fairly simple to implement in a basic form at least - it was simply a matter of increase the room size shown within GameMaker's view system for rooms. The challenge part comes in the form of making sure the interface remains consistent. Since an interface element [button, text, sprites etc...] were aligned to the interface itself to keep it on screen, should the player move the camera; it needed to have a separate parameter for each zoom level. After a couple of hours work - I managed to find a way to make sure the interface elements remain in place at various levels of zoom. I am currently debating whether or not to modify the size of the interface elements - an argument for keeping it the way that it is being that the player will be able to see more of the map whilst making decisions, one of the reasons I wanted a zooming feature in the first place. I will keep it as is for the time being; the next play-testing experience will help decide whether it is something to add or keep the way that it is. Work on Foundation of Civilisation is progressing nicely. I am taking time to plan out the game-play further before I head into coding it in; in the mean time I decided to test out a few graphical ideas I had! The style I had in mind was to go more towards a hand-drawn map style as a test. 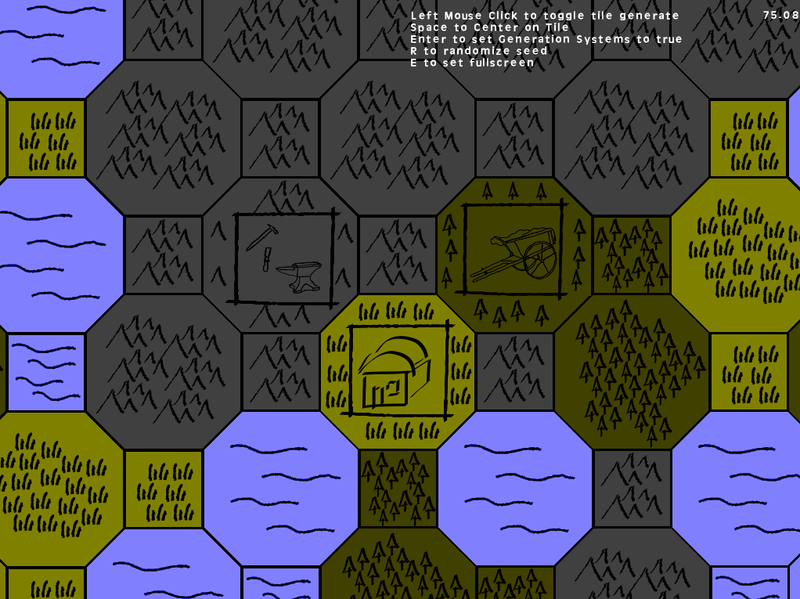 Districts and Work-Posts would be represented as shown above; giving the game a more hand-drawn style. I will most likely move towards having a more parchment-like graphic for the tiles themselves to fit this style - if I decide to go forward with it. In terms of the game-play itself - currently I have been using mind-maps to try to determine how I want to take the game forward in it's design. 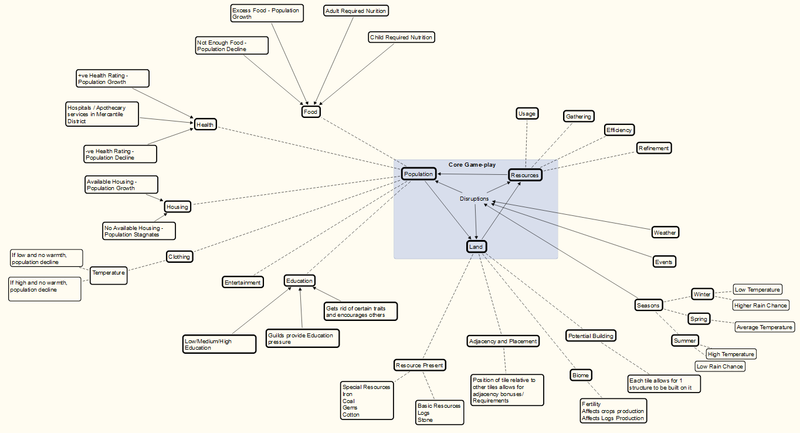 More specifically - I listed the core components that would make up the game; and starting to build outwards, fleshing out those core components until I feel they have sufficient depth. The concept game seemed to have a decent amount of game-play with it's limited amount of elements and options; fleshing out these same components to add depth and also adding other elements that might enhance the game-play [Such a During Game-Play Tutorial, Achievements, and Story Journals that characters in your nation write up based on your actions] could give the game the unique feel I was looking for. I will continue to try to concentrate my ideas towards these 3 core components - I will add different major components; if I believe it would be beneficial to the game itself! Progress on the new map generator for Foundation of Civilisation is progressing nicely. The new generator uses a different tiles [or rather two types of tiles] to create maps - the sprite sizes have also been increased to allow for better functionality! 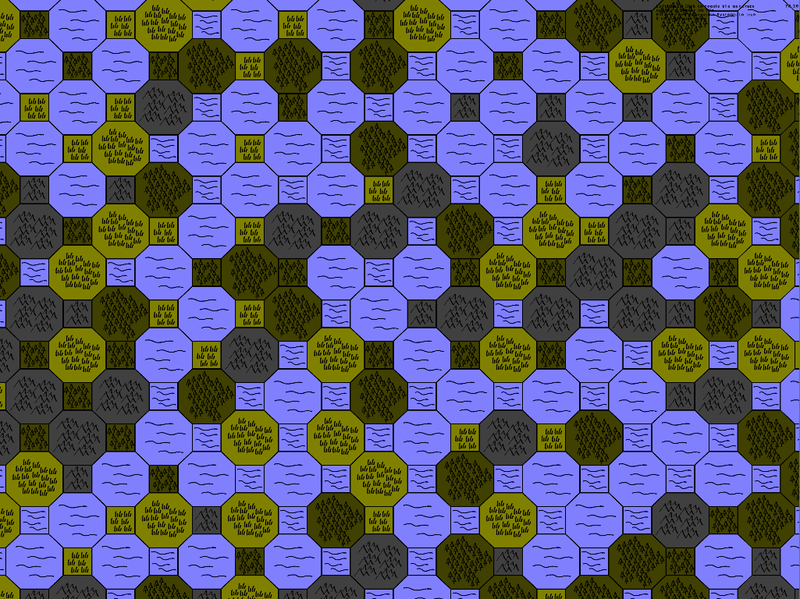 The generator works in a simple fashion; a central hexagon tile is spawned, which spawns squares at the top, bottom, left and right of the tile. The square tile then spawns a hexagon, and so on until a map is formed. Biomes are operated in a similar fashion to the old generator currently - depending on the sizes of the biome, tiles have a chance to spread their biome to a new tile; otherwise they are assigned a new tile. Certain tiles (such as forests) have a greater chance that if the next tile is not the same, it will become a grasslands biome. This is not necessarily staying as it is - but it does allow me to have extra functionality already built into the generator to use when ready! I have a few ideas for the square tiles - they can be used to spawn certain special resources or special biomes later on. The idea for adding square tiles with the hexagon tiles came to me whilst trying to figure out what tiles to use for the generator. After trying the hexagon and seeing how those tiles connected - I decided to try to fill the spawn between the hexagons with another type of tile. This was either a square or a triangle, I went with square as it was more simple and I had a good idea of how it would fit into the design of the game later on. I look forward to bringing you more on this later on!